It’s that time of year that we thank the special women in our lives, be it Mums, Grans, Auntie’s or anyone else. To give you some ideas we’ve put together a range of products to show her you care. First up we have some New Season ladies Barbour. From left to right is the Daisy Crew Neck Sweater made from 100% Prima cotton and comes in Summer Rose (pictured) or Fuchsia. The Ladies Peak Jacket is a lightweight casual jacket, perfect for the coming spring/summer months, and a detachable hood makes it very practical as well as stylish. The ladies Elm Shirt comes in this lovely Blackcurrant colour and is made from 100% cotton. Finally the Morris Utility Wax Jacket comes with new William Morris linings in a lightweight 4oz wax, in Navy (pictured) or Olive. 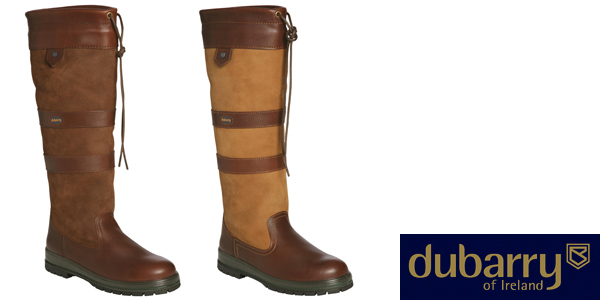 Dubarry are know for their boots, and not least these, the Dubarry Galway boots. These are waterproof boots which are GORE-TEX® lined, and incredibly comfortable to wear. Anyone already with a pair will know how good they are, and you will see them worn all year round. Dubarry even have a range of footwear cleaning and protecting products, to ensure they last as long as possible. To see their aftercare range, click here. The Barbour Floral Print Tote Bag on the left features this lovely poppy design from Barbour’s Country Cottage floral print designs, and comes with real leather trim. In the middle is the Dubarry Dalkey leather handbag which comes in Walnut (pictured) or black. With pockets inside and outside you won’t get anything lost in this bag. On the right is the Barbour Mini Floral Print Beaufort shoulder bag which is great for evenings or when you don’t need to take much out. Hunter boots come in all shapes, sizes and colours. Here we have a sample of their popular gloss range in Fuchsia, Sovereign Purple and Violet. Other colour and styles are available on our website. In cold weather we can’t live without our welly socks, and these ones from Hunter are perfect for keeping warm. From left to right we have Red, Ivory, Grizzly and Lagoon Green and to see the others we have available, please click here. Every year you can always rely on classic gifts to be appreciated on Mother’s Day. These Cath Kidston mugs are known for their range of patterns, large size and made from 100% fine china. View our range, in the middle we have the Sophie Conran Cake Knife and Cake Server. These have been made for Arthur Price and are made with 18/10 stainless steel and are dishwasher safe. They even have a 50 year guarantee! We hope we have given you some ideas, but there’s still plenty of other options on our website which you may like. To have a look please click here. Arthur Price, barbour, Barbour bags, Cath Kidston, Dubarry, Dubarry boots, Dubarry Galway, Dubarry Galway boots, hunter, hunter boots, Hunter welly socks, Mother's Day, Sophie Conran. Bookmark.